Literary elements at work in the story: The first-person narration of this story introduces the protagonist through her own understanding of the world around her. Because she is blind, Zulay relates to the world through her other senses: she can recognize favorite people by the perfume they wear or by the gum they chew; she has a large vocabulary for the way things sound; she learns mathematical and spatial concepts by touch. The gentle unveiling of Zulay’s personality and of her sightless world is aided by Brantley-Newton’s cheerful pictures of a busy first-grade classroom. How does the perspective on gender/race/culture/economics/ability make a difference to the story? Zulay’s classmates and the parents to whom they belong are a multicultural group. Zulay herself is African American. Ms. Seeger, the teacher, seems to have done a good job of incorporating an understanding of special needs into the class: each child’s desk is marked with a name both printed and in braille. Zulay gets help with writing from her seatmate, and in turn she helps Maya with math manipulatives. The children eagerly take turns typing on Zulay’s Brailler. Nevertheless, Zulay does feel different in her class from time to time, particularly when she has to work with her occupational therapist. The book demonstrates how a community of supportive friends and good teachers can provide the bedrock for success for everyone, no matter what their gifts or challenges. Theological Conversation Partners: There are a number of scriptural connections which can be made from this story. The first concerns the results of hard work. Proverbs 13:4 promises, “Indolence wants it all and gets nothing; the energetic have something to show for their lives.” All of the children in Class 1-3 have to practice hard to achieve the goals they set for themselves at Field Day. Zulay struggles to learn how to run with her white cane, but while she drills, she hears huffing and puffing and complaining from her classmates, too. Success does not come easily for anyone, but it is all the sweeter for the perseverance that has gone into it. Zulay’s class also demonstrates the importance of two other scriptural references: the admonition to be kind to those who have physical handicaps (Leviticus 19:14) and the reminder in Romans (12:5) that we are all part of a larger body and only work well when we work together. 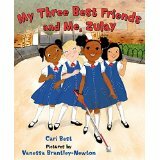 Zulay introduces readers to her pals, “Four best friends who help each other, four best friends who help themselves …” Class 1-3 seems to have internalized the power of community, helping one another as friends, supporting one another in hardship and rejoicing in one another’s successes. Why do you think that Zulay has to touch the pyramid shape before she draws one at her desk? Why does Zulay not like her folded-up white cane? Zulay says she doesn’t like it when she hears her name sticking out there by itself. Have you ever felt that your name was sticking out in your classroom? How did you feel? How do Zulay’s classmates help her? How does she help them? How did the boys and girls in Class 1-3 get ready for Field Day? Would you like to be a part of Class 1-3? Why, or why not? My Three Best Friends and Me, Zulay by Storypath is licensed under a Creative Commons Attribution-NonCommercial 4.0 International License.